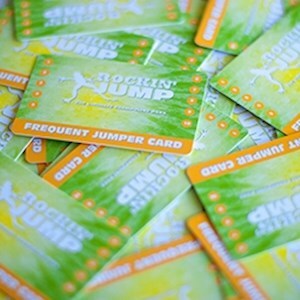 Stretch your dollars farther with the Rockin' Jump Frequent Jump Card! Purchase 10 Hours of FUN at Rockin' Jump and save big. Your Frequent Jumper Card can be used for multiple people: Friends, Family Members, even strangers. Use them during regular open jump time with no other restrictions. Plus they never expire.